Sridevi Kapoor who was earlier known to one and all as Sridevi is a popular actress in Bollywood and she had made her acting career at a very early age of four. She made her debut with a Tamil film where she performed as a child actress. At a very early age of 12, the actress made her big Bollywood debut with the movie Julie and later on she went on to act in a number of movies in various languages. Sridevi is also known to be a versatile actress in Bollywood. She has managed to act in Telugu and Hindi films she had acted gave her recognization and made her famous. As she is famous she could not stop any rumours about the way she looked and of course about her plastic surgery. The news of Sridevi plastic surgery did make news at the early stage of her career where many people thought that she might have had undergone a nose job. She had a big nose which now looks slimmer and compliments her beauty. Though the actress has always denied having a nose job a look at the pictures of Sridevi before plastic surgery make it clearly evident that she did get a nose job done. The actress made a comeback to films after a huge gap of 15 years and during a promotional interview she also talked about the rumours about her plastic surgery. When asked about the plastic surgery, the actress neither accepted nor denied the rumours. The actress even at this age looks ravishing but she says that she likes to age with grace and her beauty is certainly increasing with her age. 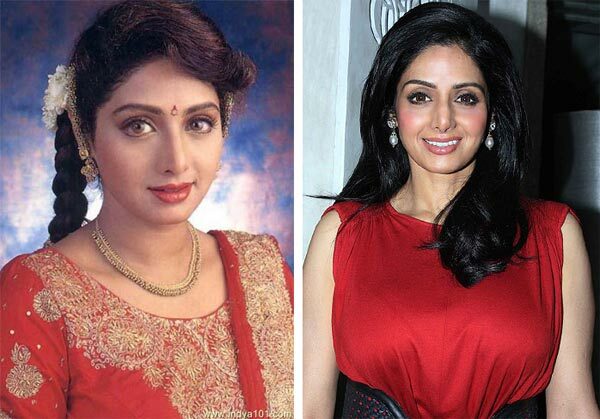 Do let us know on what you think about the plastic surgery rumours of Sridevi? Do you think it is true or do you think that the actress is aging gracefully? Do tell us.